Editor’s Note: This excellent description of the common well water problem known as iron bacteria is reprinted here from the website of the Minnesota Department of Health. I’ve added a couple of pictures. –Hardly Waite. Does this describe your water……red stains in the sinks?….swampy, oily, or other unpleasant tastes or smells?….red, slimy growths in the toilet tank? If so, your well or water system may have iron bacteria. Iron bacteria are small living organisms which naturally occur in soil, shallow groundwater, and surface waters. These nuisance bacteria combine iron (or manganese) and oxygen to form deposits of “rust,” bacterial cells, and a slimy material that sticks the bacteria to well pipes, pumps, and plumbing fixtures. The bacteria are not known to cause disease, but can cause undesirable stains, tastes and odors; affect the amount of water the well will produce; and create conditions where other undesirable organisms may grow. TASTES AND ODORS – Iron bacteria often produce unpleasant tastes and odors commonly reported as: “swampy,” “oily or petroleum,” “cucumber,” “sewage,” “rotten vegetation,” or “musty.” The taste or odor may be more noticeable after the water has not been used for some time. Iron bacteria do not produce hydrogen sulfide, the “rotten egg” smell, but do create an environment where sulfur bacteria can grow and produce hydrogen sulfide. COLOR – Iron bacteria will usually cause yellow, orange, red, or brown stains and colored water. It is also sometimes possible to see a rainbow colored, oil-like sheen on the water. RED SLIMY DEPOSITS – Iron bacteria produce a sticky slime which is typically rusty in color, but may be yellow, brown, or grey. A “feathery,” or filamentous growth may also be seen, particularly in standing water such as a toilet tank. The characteristics listed above are typical of iron bacteria. However, objectionable stains, tastes, or odors may be due to other causes including iron, sulfate, hydrogen sulfide, manganese, or other nuisance organisms such as sulfur bacteria. Identification of substances in water is best done by having a laboratory test a water sample. Many laboratories provide iron bacteria tests for costs under $35. It is also a good idea to evaluate the sanitary quality of the well by doing two things: (1) testing the water for nitrate-nitrogen and coliform bacteria; and (2) assuring that the well is properly constructed, located, and maintained. Iron bacteria are present in most soils in Minnesota. Iron bacteria can be introduced into a well or water system during drilling, repair, or service. Elimination of iron bacteria once a well is heavily infested can be extremely difficult. Normal treatment techniques may be only partly effective. Water placed in a well for drilling, repair, or priming of pumps should be disinfected, and should never be taken from a lake or pond. The well casing should be watertight, properly capped, and extend a foot or more above ground. When pumps, well pipes, and well equipment are repaired, they should not be placed on the ground where they could pick up iron bacteria. The well, pump, and plumbing should be disinfected when repaired. Treatment techniques which may be successful in removing or reducing iron bacteria include physical removal, pasteurization, and chemical treatment. Treatment of heavily infected wells may be difficult, expensive, and only partially successful. Physical removal is typically done as a first step in heavily infected wells. The pumping equipment in the well must be removed and cleaned, which is usually a job for a well contractor or pump installer. 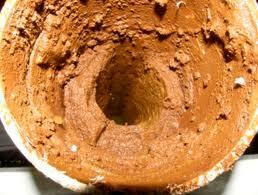 The well casing is then scrubbed by use of brushes or other tools. Physical removal is usually followed by chemical treatment. Pasteurization has been successfully used to control iron bacteria. Pasteurization involves a process of injecting steam or hot water into the well and maintaining a water temperature in the well of 60°C (140 degrees Fahrenheit) for 30 minutes. Pasteurization can be effective, however, the process may be expensive. Chemical treatment is the most commonly used iron bacteria treatment technique. The three groups of chemicals typically used include: surfactants; acids (and bases); and disinfectants, biocides, and oxidizing agents. Surfactants are detergent-like chemicals such as phosphates. Surfactants are generally used in conjunction with other chemical treatment. It is important to use chlorine or another disinfectant if phosphates are used, since bacteria may use phosphates as a food source. Acids have been used to treat iron bacteria because of their ability to dissolve iron deposits, destroy bacteria, and loosen bacterial slime. Acids are typically part of a series of treatments involving chlorine, and at times, bases. Extreme caution is required to use and properly dispose of these chemicals. Acid and chlorine should never be mixed together. Acid treatment should only be done by trained professionals. Disinfectants are the most commonly used chemicals for treatment of iron bacteria, and the most common disinfectant is household laundry bleach, which contains chlorine. chlorine injection into the well has been used, but is not normally recommended because of concerns that the chlorine will conceal other bacterial contamination and cause corrosion and maintenance problems. 10 gallons of water, and poured into the well. If possible, the chlorinated water should be circulated through the well and household plumbing by running the water back into the well through a clean hose, washing down the sides of the well casing. The chlorinated water should be drawn into the household plumbing and remain overnight, and if possible for 24 hours. Heavy infestations of iron bacteria may require repeated disinfections. Shock chlorination may only control, not eliminate, iron bacteria. Before attempting to chlorinate, or doing any maintenance on a well, it is important to disconnect the electricity and understand how the well and water system works. It is usually advisable to hire a licensed pump installer or well contractor. High concentrations of chlorine may affect water conditioning equipment, appliances such as dishwashers, and septic systems. You may want to check with the manufacturer of the appliances before chlorinating. The equipment can be bypassed, however, iron bacteria or other organisms may remain in the units and spread through the water system. It may be possible to disinfect the well with higher chlorine concentrations; and if the water storage and treatment units are not heavily infected, disinfect the treatment unit and piping with lower concentrations circulated through the water system. After the chlorine has been in the well and plumbing overnight or for 24 hours, the water should be pumped out. If possible, water with high chlorine concentrations should not be disposed of in the septic system. It may be possible to discharge the water to a gravel area, run the water into a tank or barrel until the chlorine dissipates, or contract with a hauler to properly dispose of the water. Water from the well should not be consumed until the chlorine has been removed.